Jennifer with Frank Everett of Sotheby’s. She wears a 1941 Paul Flato necklace once owned by Norma Shearer. 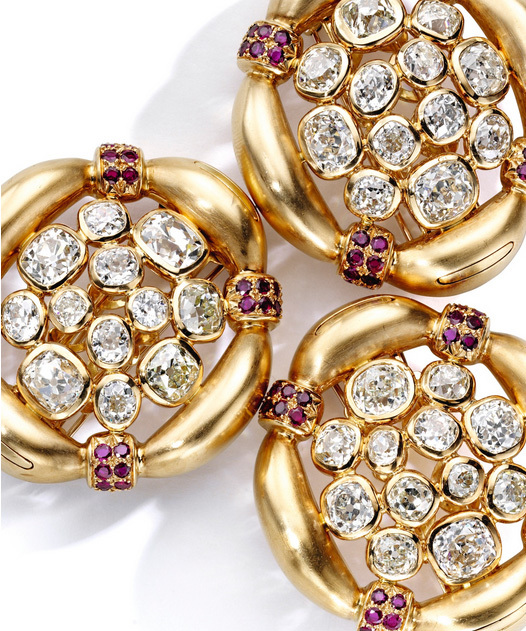 I was researching vintage Bulgari brooches when I found an interview over at the Hollywood Reporter called “Jennifer Tilly On How She Collects Fine Jewelry.” Jennifer made me laugh so much when she admitted in the documentary Crazy About Tiffany’s that she has taken on film roles just to pay her jewelry bill. I love that! 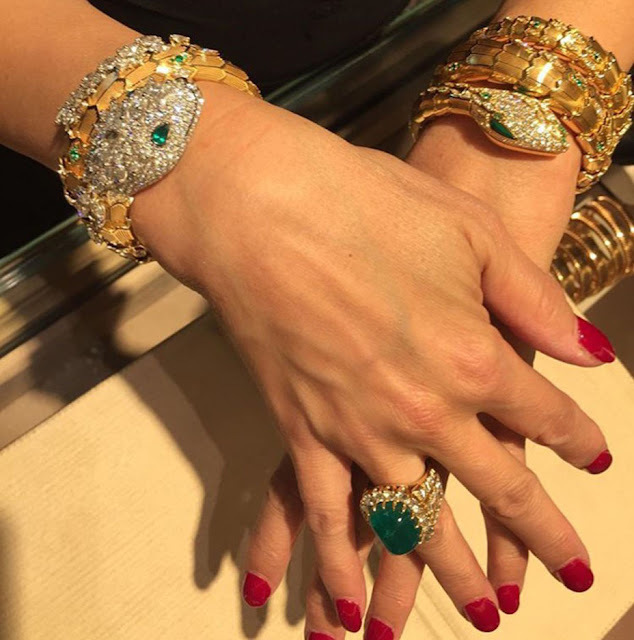 She has some great tips about collecting in the article and my favorites are her recommendation to purchase from auction houses and to remember that there are shady people in the jewelry world! When I attended Lueur NY in October of last year I recall one of the vendors looking around at his fellow dealers in the room and saying with a slight sneer on his face, “There are a lot of liars in this business.” Jennifer Tilly apparently agrees with him! A still from Crazy About Tiffany’s. Jennifer wears her Schlumberger brooch. Liz owned one too. A great shot of Jennifer wearing a David Webb ring and Bulgari bracelets. Photo courtesy of Jennifer Tilly. The interview was to garner some press for the Sotheby’s “Magnificent Jewels” auction earlier this month so there is also a quick and fun video of Jennifer in Los Angeles with both Frank Everett of Sotheby’s and Cameron Silver of Decades, the upscale consignment boutique with vintage couture. She tries on a few nice gowns and of course, some amazing gems! Have a look if you get a chance, it is less than five minutes. Jennifer tries on a necklace by René Boivin, circa 1960, once owned by Babe Paley! The necklace converts to three clips. I weep! Photo courtesy of Sotheby’s. I cannot think of another modern actress who is so vocal about her love of jewelry and has put serious cash toward the collecting of it so I always get a kick of seeing what pieces Jennifer is wearing and learning what she knows about jewelry in general, and also about its use in old Hollywood. I always learn something new from her and she makes it so entertaining too. Thanks to both the Hollywood Reporter and Sotheby’s for giving Jennifer a platform to share her jewelry knowledge and stories with us! Also love the Boivin Necklace which is stunning. That it was owned by the equally stunning Babe Paley makes it even more iconic. I am not aware of any current actresses who are known as collectors of jewelry other than Ms. Tilley. One of the greatest jewelry collectors was Marlene Dietrich. I am sure much of her collection were gifts from her many lovers. One of the most famous is the diamond & ruby Jarrettier Bracelet designed by Van Cleef in the 1930's. It is HUGE & was the only piece of her collection that she kept until her death. It was so fun to find out that necklace was owned by Babe Paley. It was last sold in 1992. I hope it went to a good home! I know EXACTLY the VCA bracelet owned by Dietrich you are talking about, it is in my VCA book I have practically memorized and was on view in the 2011 VCA exhibit. It is gorgeous. I can understand why she kept it. I do remember an actress who had quite a jewelry collection. It was Ellen Barkin. She had to sell all of it (about 100 pieces) 10 years ago after her abrupt divorce from Ron Perelman At the time it was valued at 20 million. Don't hear to much of her now.